It really is the cutest thing in the world to watch dogs in snow for the first time! They are intrigued by what they see and feel and taste. While it’s fun to watch, we want to make sure that your have properly winterized your pup before taking him out into the cold snowy world! Here are five winter pet safety tips to help you along the way. If you notice that your dog tends to be cold even during the summer a/c season, then you should start getting sweaters and cozy beds for your pup to keep him warm. There are coats and even shoes for dogs so don’t be shy. It’s best to have them warm than cold and they’ll appreciate you. This is one the best winter pet safety tips to implement. 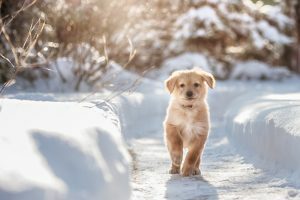 Since you know it’s going to snow or that it’s snowing well before your dog will, it will be most advantageous for you to shovel a patch of grass for your dogs in snow to use when it’s time for elimination. It may be a bit of work for you to carve out, but it’s for the best! Give your pup a treat to further encourage elimination in that area. It’ll work, trust us. During this time, it’s expected that salt is going to be practically everywhere on the ground which can present dangers for dogs in snow. You want to try to keep your pup from consuming any of it. It’s not toxic to them but it will upset their stomachs and that’s no fun. Antifreeze on the other hand is extremely toxic so you really want to make sure that you’re diligent about keeping him away from that. It may smell good but it’s sweet and intriguing. The color is blue or green so be aware of it on sidewalks and other surfaces outside. If you’ve been out for too long or just simply notice that your dog is having a hard time warming up, you can do it for him. Cover your pup with a towel or blanket. A warm blow dryer will help tremendously. Because with heating pads because they could burn their skin. Conversely, putting warm uncooked rice in a sock is a good alternative. Your pup’s pads may become dry during the winter season and especially when there’s snow on the ground. Check your local pet supply store for some soothing balm for their pads. If possible, apply the balm and then cover their pads to keep them from walking or licking it off. Make sure that you clean your puppy’s pads after being outside.